Addressing a New York foreign policy salon last week, U.S. Ambassador to the United Nations Nikki Haley adopted a folksy tone as she hinted that the Trump administration is backing away from years of U.S. insistence that Syrian President Bashar al-Assad must leave office. "I'm not going to go back into, 'should Assad be in or out?' " Haley said during a question-and-answer session at the Council on Foreign Relations. "Been there, done that, right?" she added. Her point was that Assad has hung on through six years of conflict, and while the United States would prefer otherwise, he is likely to remain. She called him an obstacle, but said Russian support for Assad does not preclude potential U.S.-Russian cooperation to try to end the war. It was the latest example of Haley, a former South Carolina governor with no prior foreign policy experience, acting as a tough-talking bellwether of President Donald Trump's foreign policy. As the new administration applies some of Trump's campaign rhetoric to the real world, Haley also has been out front on other issues, including Russian intervention in Ukraine. She used her first open address at the U.N. Security Council, just two weeks into the Trump presidency, to spell out that the United States considers the Russian annexation of Crimea illegitimate, and that sanctions on Russia won't be lifted anytime soon. A few days before, she told her new colleagues that the United States under Trump would be "taking names" of nations that try to use the United Nations to thwart U.S. goals and interests. Frequently mentioned as a potential future Republican candidate for higher office, Haley has adopted a higher profile than most Trump Cabinet officials, including Secretary of State Rex Tillerson. Her fierce public denunciation of what she calls the ritualized "bashing of Israel" at the United Nations has made her a darling of many U.S. supporters of Israel, especially on the political right. 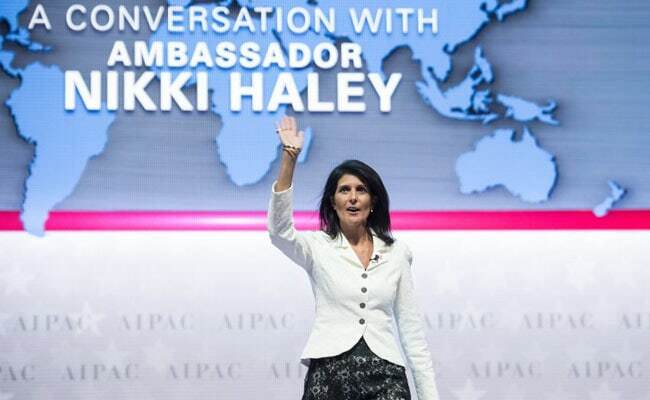 She got a rock-star welcome when she addressed the American Israel Public Affairs Committee's meeting in Washington last week. "I think they're a little lukewarm," former George W. Bush adviser Dan Senor quipped as he introduced Haley to thunderous applause at AIPAC. Haley is expected to focus on U.N. treatment of Israel as well as reforming what she says are expensive and often pointless U.N. peacekeeping missions when the United States holds the rotating leadership of the Security Council this month. On Israel, Haley has drawn criticism from longtime Mideast experts for what many see as an unnuanced view of the conflict between Israel and the Palestinians. At AIPAC, she counted as victories that a report likening Israel actions to apartheid had been withdrawn last month and that Palestinian statesman Salaam Fayyad's appointment to a U.N. post was revoked after she expressed objections. The treatment of Fayyad "shows a naivete and narrow focus that was extremely disturbing," said Gerald Feierstein, a former senior official at the State Department. The Security Council presidency will not allow Haley to immediately undo the Obama administration action that allowed passage in December of a measure condemning Israel over West Bank settlements. "Everyone at the United Nations is scared to talk to me" about the new U.S. administration's strong objection to that measure, she told AIPAC. "I want them to know that, look, that happened, but it will never happen again," she said. "We're not gong to put up with it." The applause for that was loud, but it was even louder a few moments later. "I wear heels, but it's not a fashion statement," she said. "It's because if I see something wrong, I'm gonna kick 'em every single time." The Security Council presidency is a debut of sorts, although Haley has been ambassador since late January. Nations typically use the presidency to showcase issues of special concern, and although the platform rarely attracts wide notice, the U.S. turn comes early in an administration whose priorities and approach to many global issues are still unclear. Trump's post-election remark that the United Nations is "just a club for people to get together, talk and have a good time" put the institution on edge. He added that the 70-year-old world body would be just a "waste of time and money" if it didn't reform, but stopped short of saying the United States should pull out altogether. Haley's message is nearly as blunt, but it is not yet clear how she will make good on any of the swagger or threats. She plans a news conference at the United Nations on Monday to lay out the program for the month. "The thing about clubs is they have rules, and they have a culture, and there is a constant pressure to comply with the rules of the club, and soon enough, members are doing things a certain way because that's the way they've always done them," Haley said at CFR. "I'm working to change the culture." The Trump administration has said it intends to cut U.S. support for the U.N. budget overall, and Haley has pointed specifically to what she said is an unsustainable level of U.S. support for peacekeeping operations. "I think that the United States has always been the moral compass of the world. And I think we are generous by nature. And we want to see people safe. We don't want to see people starve," Haley said in a weekend interview with Fox News geared to the start of the U.S. term. "We don't want to see people treated - mistreated - by their governments. But you do have to say, 'What can we do?' We can't be all things to everyone." Haley has charmed some U.N. diplomats and won cautious respect from others, including a senior European diplomat who noted that while his smaller country pays a larger per capita share of the U.N. peacekeeping budget than does the United States, he accepts her point. She cheered a Security Council vote Friday that extended the decades-old U.N. peacekeeping mission in the Democratic Republic of Congo with a troop contingent that she said would save millions. But Foreign Policy reported that Haley had lost a test of wills during the closed-door discussions, when she had demanded a larger cut and threatened to withhold U.S. support for extending the mission. The result was a compromise, diplomats said. At the Council on Foreign Relations, Haley said this is not the first time she has sought to challenge the status quo. "I was the first minority governor and, a real shock, the first girl governor as well" when elected in South Carolina in 2011, she said. "I was definitely an outsider." Haley, 45, is the South Carolina-born daughter of Indian immigrants. "Challenging the rules of the club didn't make me popular at the State House, but it was necessary then, and it's necessary now," she said.